TV Lesson: Answer THE Question! 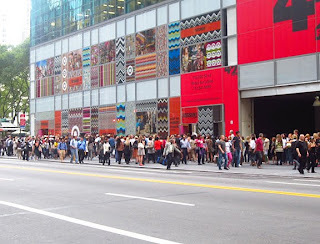 The Background: The Fashion World went nuts yesterday…nuts for Missoni at Target. Target has a history of collaborating with with high-end designers to bring great design and fashion to the masses at affordable prices. Yesterday, Target launched it’s biggest collection yet – a limited edition line from Missoni. Shoppers crashed Target’s website and mobile website and swarmed stores like locusts in their excitement and the merchandise was gone in the blink of an eye. Glitzy Missoni ads are still running on TV and in print, more than 40 magazines on newsstands have stories about the line, and consumers are hungry for the merchandise. Meanwhile, Target store shelves are bare, Target’s website is STILL down, The Missoni For Target merchandise is already selling on eBay for more 5 times the retail price, and every local and national news organization is covering the story. The big question on Target shopper’s mind is – WILL THERE BE MORE MERCHANDISE??? Most shoppers are disappointed, frustrated, and upset that they can’t get the Missoni. Target VP of Communication Dustee Jenkins appeared on GMA this morning and had an incredible opportunity to speak directly to shoppers. The questions were: Will there be more merchandise? Did they plan properly? She could have thanked shoppers for their incredible response, acknowledged the situation directly, and provided some useful information – no, there’s no more merchandise. Some shoppers will return items, so you may see some merchandise returned to stores, but we can’t predict when and where that will happen. We thought we planned well – we ordered twice as much as we usually do for our designer collaborations, but we didn’t anticipate THIS much demand! We’re sorry if you didn’t get what you want. We will use this information to plan future launches. Thank you for your patience, understanding and for turning out the way you did! This would have built trust with shoppers and helped them remain loyal to the brand despite a bad experience. Instead, Dustee smugly patted herself on the back for running great pr campaign, flaunted the great line in front of customers that can’t get it, and coyly said keep checking back to their stores to see if there’s anymore. Way to slap customers in the face Dustee! Target blew the opportunity and fanned the flames of customer frustration instead of informing, appreciating and soothing customers. Bottom line, this is going to cost Target at the cash register and in customer loyalty. Target knows how to handle this situation. Target has been doing a great job interacting with frustrated customers on Twitter and Facebook. Unfortunately, Dustee blew it in front of millions of viewers and customers. Time to give Dustee the boot (preferably the Missoni zigzag rainboot for Target).